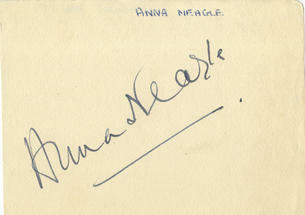 This is an In Person Signed Autograph Album page 5" x 4" by the late English Stage and Motion Picture Actress and Singer. Dame Anna Neagle, DBE (20 October 1904 - 3 June 1986), born Florence Marjorie Robertson, was a popular British stage and film actress and singer. Neagle proved to be a box-office sensation in British films for over 25 years. She was noted for providing glamour and sophistication to war-torn London audiences with her lightweight musicals, comedies and historical dramas. She won several awards as Britain's favourite actress and biggest female box-office draw. Almost all of her films were produced and directed by Herbert Wilcox, whom she married in 1943. In her historical dramas, Anna Neagle was renowned for her portrayals of real-life British heroines, including Nell Gwynn (Nell Gwynn, 1934), Queen Victoria (Victoria the Great, 1937, and Sixty Glorious Years, 1938) and Edith Cavell (Nurse Edith Cavell, 1939).